Unless you can’t imagine dinner without some kind of flesh, Water should be on your list for culinary excitement. It’s Japanese vegan cuisine. Created by restaurateur and bar impresario Ravi DeRossi, who specializes in vegetarian and vegan cuisine, along with the masterful Chef Steve Pereyda, Fire & Water has hung its sign at 111 East 7th Street. It’s just one door down from another DeRossi restaurant, Ladybird. Fire & Water is a dual concept. Fire is a vegan dim sum restaurant, Water is vegan Japanese (Fire is opening soon, and we hope to be the first in line). There is one tasting menu with two seatings nightly, Tuesday through Sunday, at 6:30 and 8:30. The menu is $65, with wine and saké available. We had a sake-and-wine pairing with each course and recommend it. What’s on the menu? It doesn’t matter: Every bite is memorably exquisite. We hadn’t even left the table when we hungered to return for more. No matter how innocuous a dish sounds—seaweed salad, tempura pumpkin—each bite is sublime. 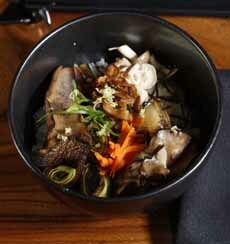 Familiar foods like soba noodles and tofu are the best you can imagine, handmade by Chef Pereyda. The dishes are so packed with vibrant flavor and texture, that you can’t possibly miss fish and meat. The first seven courses (dessert comes later). If we had to pick a favorite—and it’s tough—it would be the Mushroom Chirashi, a revelation (both photos courtesy Fire & Water). 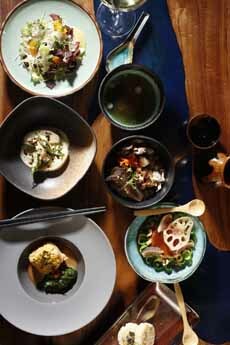 There is an extensive saké list created by sommelier David Yi-Hsian Dong, and wines that also pair well with the cuisine. This is an intimate dining experience. The space is small; dinner is served at an L-shaped bar of seven seats, where you get to watch Chef Pereyda gracefully preparing your food. There’s a table tucked into the front window that can accommodate four people, but you don’t get to see the food prep—an enjoyable part of the dinner. The decor is thoughtful and lovely. The bar is a slab of a beautiful tree, its natural crevices looking like water flowing through the wood. We wanted to take home the wallpapers in both the dining room and the restroom. The only downside: After this restaurant is “on the map,” we’ll have to wait months for a seat.